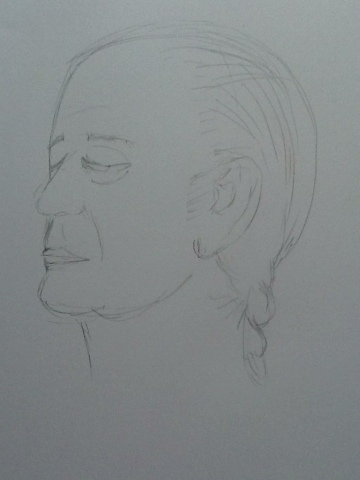 Today I sat at Starbucks and surreptitiously sketched a stranger's face. What an interesting experience. First of all, it helped me technically. 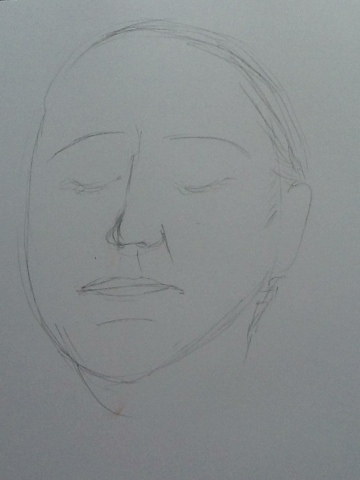 I was able to focus on details we frequently take for granted: the jawline, the indentations under the nose, age lines. In some ways, because I was not connected to this gentleman (and I know it doesn't look like the same person in both drawings, but it is! ), I could be more objective about sketching things I might ignore in someone I know, especially if I don't want to offend him/her. Who wants their wrinkles drawn in? Who wants to know that others see his/her "imperfections"? As I was drawing this gentleman, he was reading the newspaper with that downward look of someone who is farsighted. That led to a sleepy look in the picture. In this picture he was reading the page on his right. This led to something between a three-quarters view and a side view. While I drew this picture, he was reading the page on his left. This gave me a good front view to draw. This view is more representative of how this gentleman actually looks. But it still probably doesn't look like him! While drawing this gentleman helped me technically, I also discovered an emotional result of drawing a stranger: I felt connected to him. I noticed details about him that led to a general belief about his character. He seemed relaxed. He had a braid falling past his shoulders, so he seemed unconventional. And I noticed his actions. He frequently looked up from his reading to see what was going on with the people around him, so he seemed observant (I don't think he observed me, however--I hope not!). When a nearby woman sneezed, he blessed her, and that seemed kind to me, the opposite of self-absorbed. I started liking this guy, and I never spoke a word to him. I realize this regard is based completely on assumption, but it's interesting to ponder. I am becoming addicted to sketching faces. So watch out--who knows whether you'll find me sketching your face at a Starbucks near you!